This is block #8 of our City Girl Sew Along, called "Coffee Shop". The Riley Blake Designs background fabric is called Quatrefoil (C345) and I love it! The white and light gray are also by RBD. All the blocks in this sew along have simpler lines, some with a tad more detail than others but, in the whole, we are going for a modern look. These RBD fabrics are perfect for a city girl, although the blocks are looking awesome with other fabrics too (wait 'till the end of this post to see what I mean!). Coffee Shop was machine appliqued using blanket stitches but you can use any stitch you like, even invisible with monofilament. As I chose a solid fabric for both the cup and the steam, I thought blanket stitches would add texture to the motifs (besides the fact I like blanket stitching...). Trace template shapes (for template, click here) onto smooth side of fusible web. 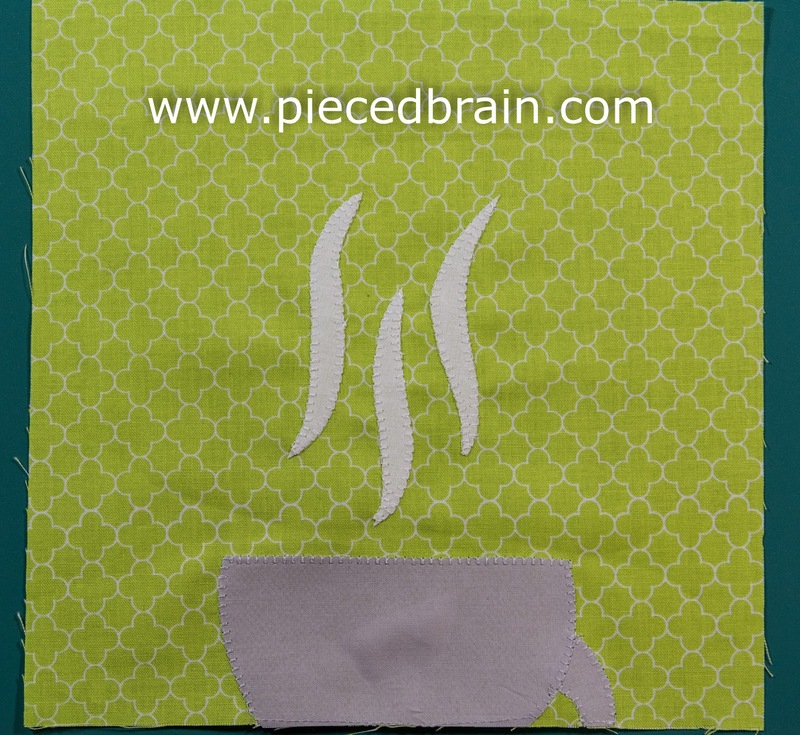 Cut shapes and fuse them to wrong side of cup and steam fabrics (for more details about using a fusible web, click here). 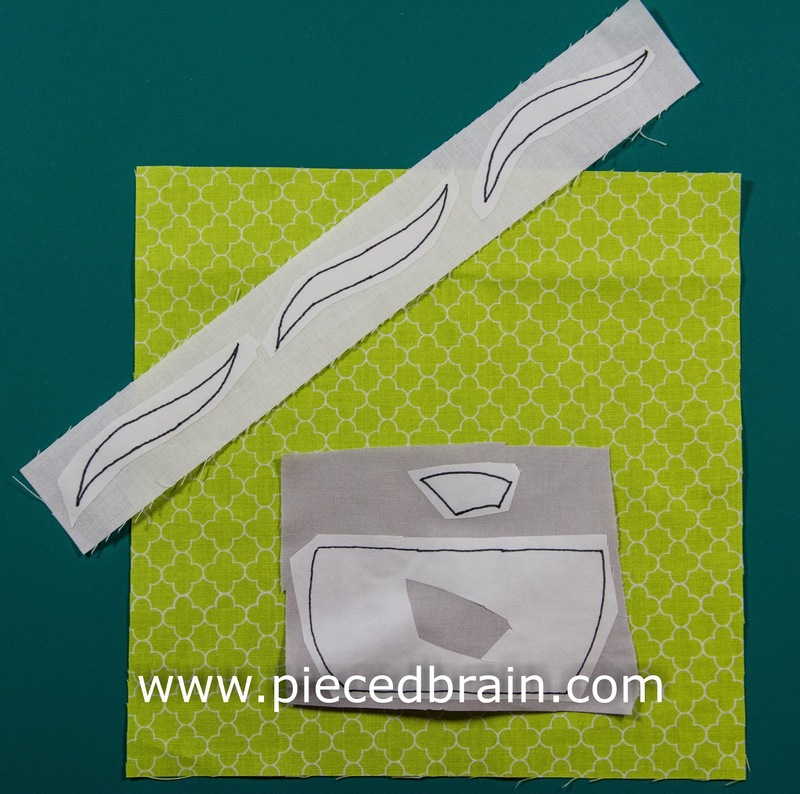 Remove paper from back of shapes, place them onto background fabric and press them. 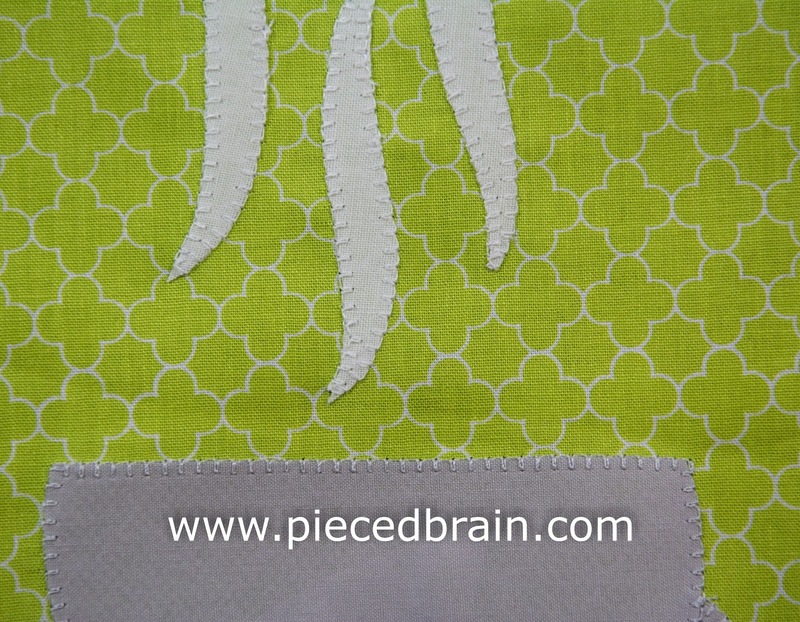 Blanket stitch around shapes using matching thread. Look at the tips of each steam piece on photo above: although they are very thin and the blanket stitch does not cover them, I will remedy it when I quilt around each piece with monofilament. This way, all edges will be secure. And this is it! Another block for our sew along. I can't wait to have all the blocks done so I can make this sampler quilt adding sashing to tie it all together, and a fun border. Speaking of fun, Annmarie just sent me a picture of her latest blocks - they are beautiful! I like her rendition of The Loft, the block in the middle, as well as how different the blocks look from mine due to her choice of fabrics. Thanks for sending the picture, Annmarie. It makes up for the fact that we don't live in the same neighborhood. What would we do without the internet? I hope your day is as bright, blue, and breezy as mine is. I will talk with you soon!